The Clio Awards recognize advertising that's a cut above. But for its call-for-entries ads this year, the famed creative awards show went with more of a sideways slice. Four ads from Leo Burnett—scroll down to see all four in full, as well as some sections in detail—show amusingly fictitious factoids about creative people presented in percentage terms. 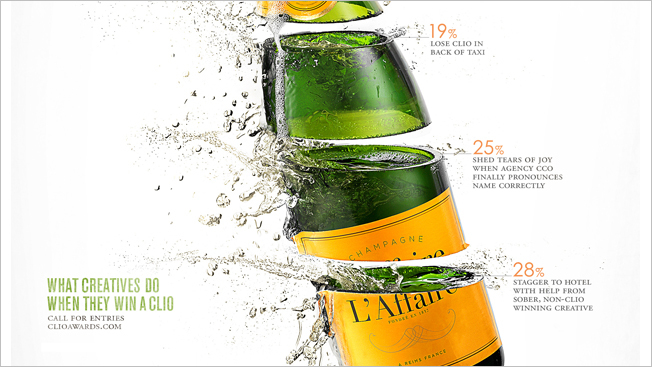 For example, one ad claims to explain "What creatives do when they win a Clio." Answers include "17% try to hit on that producer from that other agency" and "19% lose Clio in back of taxi." To visually illustrate the percentages, Burnett creatives Pablo Jimenez and Doug Burnett took items like a champaign bottle, a coffee cup and a Chinese takeout container, chopped them into pieces horizontally and photographed them—resulting in eye-catching set pieces that are designed to strike a chord, in a tongue-in-cheek way, with Clio's creative audience. "We had an idea for more serious statistics about things in the industry. But then we realized we could make it funny and over the top," said Burnett. "From there, we were thinking of how we could make an interesting visual out of it. And we thought, 'What if we literally slice things into pieces?' "
For the fake statistics, the creatives cooked up hundreds of lines. "We brought some experiences of our own, and also stories we heard from other people around the agency," said Jimenez. "We went with the ones that felt more meaningful and relevant." The images were shot practically rather than computer generated. "It's all in camera," said Burnett. For the champagne ad, production company Alter literally sliced a Veuve Cliquot bottle into pieces, put plastic on the bottom of each piece, filled it with champagne, blew wind at it and took pictures. "It was so cool to be in there to see the way that they shot it," said Burnett. There are all sorts of little details in the ads. In the takeout ad, for example, there's a tiny joke written on the fortune cookie slip. (It reads, "Work hard tonight. It'll die in focus groups tomorrow.") Also, the columns on the pagoda are Clio silhouettes, and there's a Clio symbol above each doorway. "You can look at these ads from a distance and see something, and then go in deeper and see lots of little details," said Burnett. "The deeper you go, the more story you get." The fourth ad in the series, being unveiled just this week, shows an actual creative person sliced into parts. (Actually, they photographed three separate people for the ad.) It promotes the Clio ceremony on May 15 and claims to explain "What creatives wear to the Clio Awards ceremony." "It's about how quirky creatives can be when they go to award shows," said Jimenez. "We looked at a lot of medical illustrations from the 1920s," Burnett added. "We wanted to get the beautiful intricacies of medical illustrations—once again, to have more story as you go deeper into the image." You still have until this Friday, March 1, to enter the Clios at clioawards.com.